The Vocational Nursing program is a full time course of study and lasts three semesters, with a summer break. A new cohort of students begins every 18 months as follows: Fall 2020, Spring 2022 etc... Upon successful completion of the program, graduates receive a Certificate of Achievement in Vocational Nursing, and are eligible to receive an Associate of Science Degree in Vocational Nursing if all college AS degree requirements are met. 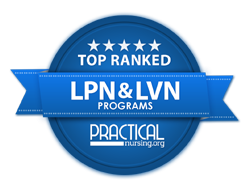 The Vocational Nursing program prepares applicants to practice as competent, compassionate and ethical Licensed Vocational Nurses (LVNs). The program provides a high quality vocational education program which is sensitive to the diverse needs of our students and our community. We facilitate educational access and academic excellence through a learner-centered nursing program, and prepare students to successfully pass the National Licensing Exam (NCLEX PN) and to practice Vocational Nursing in a variety of health-related settings: skilled nursing facilities, assisted living facilities, Residential care facilities, memory-care units, sub-acute care units, hospice and home health agencies, school districts, jails, clinics, surgery centers and physician’s offices.